Fission Story #51 described problems caused when ice inside nuclear plants melted. 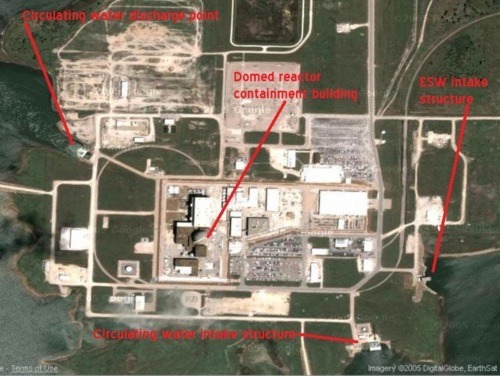 This story covers the flipside to that situation – problems caused when ice forms outside a nuclear plant.In the early morning hours of January 30, 1996, the Wolf Creek nuclear plant in Kansas operated at 98 percent power. It was a cold morning: the water temperature of the lake that was the source of cooling water for the plant was only fractions of a degree above 32°F. The air temperature was colder; around 8°F. And a steady wind of nearly 16 miles per hour made it seem even colder. Shortly before 2 am, alarms sounded in the control room warning the operators about problems developing at the circulating water intake structure. 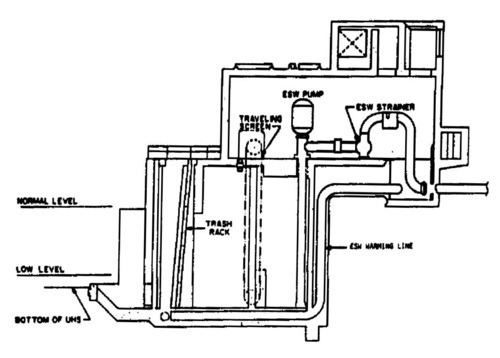 The circulating water intake structure, located in the lower right portion of Figure 1, houses three large, motor-driven circulating water pumps that send tens of thousands of gallons of lake water each minute through underground pipes to the condenser where it removes waste heat from the nuclear reactor. The water, warmed 30 to 40°F by the waste heat, returns to the lake via discharge piping shown in the upper left portion of Figure 1. On this night, only two of the three circulating water pumps were operating. The third had been taken out of service the previous day for maintenance. In addition to these three pumps, the circulating water intake structure also houses the service water pumps. The extremely cold air blowing across the top of very cold water caused frazil ice to form. The two circulating water pumps that were running pulled this slushy mix into the intake structure and past the trash racks designed to stop large debris, The ice collected against the traveling screens. Figure 2 shows a cross-section view of the emergency service water (ESW) intake structure at Wolf Creek, similar in design to the circulating water intake structure. The traveling screens, one per pump, are metal mesh screens moving around wheels on either end like a treadmill. These screens prevent debris larger than 3/8-inch from entering the plant. As frazil ice built up against the traveling screens, it formed an ice dam that blocked the incoming flow of water. The control room alarms indicated that the performance of the circulating water and service water systems was being impaired. Ten minutes later, the operators started both of the ESW pumps as a precaution. The ESW intake structure at Wolf Creek is located in a separate building as shown in Figure 1. The service water system and the emergency service water system supply lake water to chillers for air conditioning units, lubricating oil coolers for the emergency diesel generators, heat exchangers for in-plant cooling systems, and other equipment. The service water system was designed for normal operation and was not built to the high quality standards and subjected to the ensuing testing and inspection regimes accorded a safety system. The ESW, as a safety system, was built and maintained to higher standards. During normal operation, these two systems are cross-connected by a pipe. This allows pumps from either system to supply lake water to all plant equipment. Under accident conditions, valves are closed in the pipe cross-connecting the systems. This ensures the ESW system can supply adequate lake water to cool the emergency diesel generators, control room ventilation system, and other vital plant equipment without losing water through a broken pipe in the lower quality service water system. For additional redundancy and diversity, the ESW pumps are housed within a concrete structure at the lake separate from and somewhat distant from the structure housing the service water pumps. Conditions continued to deteriorate as more ice built up at the intake structures. The reduced circulating water flow rate impaired the condenser’s ability to cool the steam leaving the main turbine and convert it back into water. As a result, the vacuum inside the condenser normally created by the condensed steam began eroding. The reduced service water system flow rate caused equipment cooled by this water to begin to heat up. At 3:37 am, the operators manually tripped the reactor, causing the control rods to insert into the reactor core within seconds to stop the nuclear chain reaction. It became necessary to shut down the reactor due to the degrading conditions, but that step carried a price. With the reactor shut down, the amount of waste heat being returned to the lake dropped significantly. As shown in Figure 2, Wolf Creek was designed with warming lines that recycled some of that warm water to the circulating water and ESW intake structures. The heated water flowing from the warming lines into the intake structures was intended to prevent ice build-ups. With the reactor shut down, the warming lines were returning lower temperature water to the intake structures, which in turn meant less effective protection against ice build-ups. The operators had started both ESW pumps without using approved procedures. Their supervisor directed them to “wing it” and not waste time finding the procedures and plodding through it step by step. In their haste, the operators omitted a step. They should have closed closed valves in the piping that cross-connected the ESW system to the normal service water system. As a result, a sizeable amount of the heated water that should have flowed through the warming line into the ESW intake structure was actually flowing through the cross-connection into the service water system’s warming lines to the circulating water intake structure. The reactor’s shut down lowered the temperature of the water flowing through the warming lines. The ESW system improper cross-connection with the service water system decreased the amount of water flowing through the warming lines to the ESW intake structure. When the oncoming dayshift crew of operators took over at 7:00 am, an operator noticed that the ESW system was still cross-connected to the service water system contrary to procedures but did not correct it. Ice continued to build up at the ESW intake structure. At 7:47 am, the operators turned off ESW Pump A when the accumulated ice blocked the flow of lake water to it. With the slight warming occurring during daylight hours and workers installing temporary heaters in the ESW intake structure, the ice accumulation lessened sufficiently to allow the operators to restart ESW Pump A at 3:43 pm. But another long, cold night awaited. More ice accumulation forced the operators to turn off ESW Pump A at 7:23 pm. A worker at the ESW intake structure notified the control room operators at 8:02 pm that the water level in the bay around ESW Pump A was ten feet below normal and the water level in the bay around ESW Pump B was steadily dropping. This indicated that the ice buildup was restricting lake water flow into the intake structure to less than the amount being pumped out by ESW Pump B. The water level on the pump’s side of the ice dam was dropping. Left unchecked, it would only be a matter of time before ESW Pump B must also shut down. Senior managers at the plant met that evening to discuss the bleak situation. If the water level for ESW Pump B dropped another seven feet, emergency procedures would direct them to declare a Site Area Emergency, the most serious of the NRC’s four emergency classifications. At that time, there had only been two Site Area Emergencies declared in U.S. history – in March 1979 following the partial meltdown of the Unit 2 reactor core at Three Mile Island in Pennsylvania, and in August 1991 following a loss of offsite power complicated by failure of in-plant power supplies at the Unit 2 reactor at Nine Mile Point in New York. The operators were directed to use the B loop of the Residual Heat Removal (RHR) system to cool the reactor water temperature down to 200°F. The reactor had been shut down nearly 16 hours earlier and its water temperature had already dropped below 350°F. The RHR system takes water from the reactor vessel, routes it through a heat exchanger, and returns the cooled water to the reactor vessel. The ESW system supplies water to the RHR exchanger and carries away its heat. This step maximized the amount of waste heat carried away by ESW loop B. More importantly, this step increased the temperature of the water returning to the ESW intake structure through the warming line. The worker at the ESW intake structure reported to the control room at 9:28 pm that the water level around both ESW pumps matched the lake’s water level. Enough water was getting past the ice dams to restore the water levels. Operators restarted ESW Pump A at 10:14 pm. Less than 15 minutes later, they had to turn if off again. The worker at the ESW intake structure reported that the water level around ESW Pump A was now 12 feet lower. Ice once again blocked the flow of lake water to ESW Pump A. At 2:38 am on January 31, senior managers authorized a diver to enter the bay around ESW Pump A to inspect the ice buildup. Workers flushed hot water through piping to try to melt the ice. They hooked up air hoses to compressors and blew air into piping to try to break up and dislodge the ice. It took another day of such efforts before ESW Pump A could be returned to service. The reactor core was not damaged in this event at Wolf Creek. The spent fuel was not damaged in this event at Wolf Creek. The NRC was not amused by this event at Wolf Creek. They fined the plant’s owner $300,000 for numerous failures in its response to the frazil ice buildup, such as failing to follow procedures by letting so much of the ESW warming line flow actually go down the service water system warming line instead. Desperate times call for desperate measures like abandoning procedures in the rush to start the ESW pumps. However, shortcuts taken during the rush mean workers have the responsibility of verifying proper outcomes at the earliest opportunity. The greatest danger was encountered many hours after the reactor was shut down when one ESW pump was lost and the second seriously challenged. That time provided an opportunity to address the vulnerability, but little constructive measures were taken before nightfall the associated declining temperatures once again placed the plant in harm’s way. The decision to use RHR loop B to cool the reactor water temperature caused more heat to be in the water flowing to the warming lines at the ESW intake structure. Shortly thereafter, the ice buildup lessened to the point of restoring sufficient flow to ESW Pump B. Even if this decision did not save the day, it certainly had the effect of restoring safety margins at a time when conditions had been deteriorating. The first two items involve negative lessons: mistakes that should be avoided in the future. The third item involves a positive lesson: sound decision-making that should be emulated. As this event fades into history, these lessons can fade from memory. Plant workers and NRC inspectors must be schooled, and re-schooled, on events like this one.